"Imaging apparatus, such as digital still cameras, have been reduced in size and thickness. 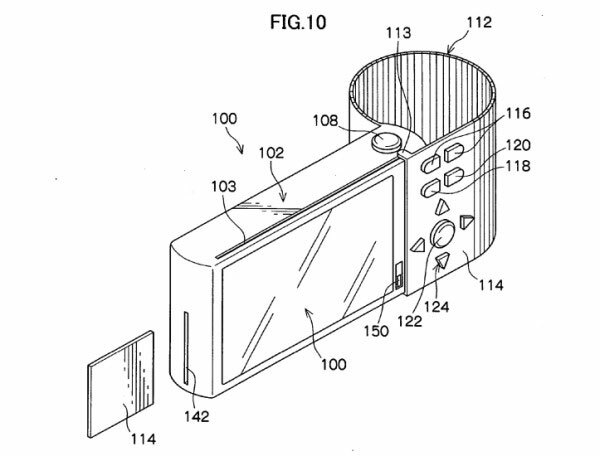 Such an imaging apparatus includes an apparatus body having a flat, substantially box-like shape, an imaging lens provided on the front side of the apparatus body, and a display unit, such as a liquid crystal monitor, provided on the rear side of the apparatus body. An imaging apparatus reduced in size and thickness is often gripped only by the tips of user's fingers at the time of capturing an image. In this case, the user has a poor gripping sensation. When the user presses an imaging button without an adequate gripping sensation, a captured image is likely blurred or what is called a hand-shake likely occurs. Further, when the display unit provided on the rear side of the apparatus body is large, the palm and the tips of fingers disadvantageously hide the display unit when the user grips the apparatus body. When the user grips the apparatus body in such a way that the palm and the tips of fingers do not hide the display unit, the apparatus body is not stably gripped. On the other hand, when the apparatus body is provided with a grip that can be gripped by a hand, the grip protrudes from the apparatus body and degrades the portability of the apparatus." "In order to solve these problems, Japanese Unexamined Patent Application Publication No. 2007-12796 discloses a solid-state imaging device in which green, blue, and red photoelectric conversion units are laminated in a depth direction of the same pixel. In the solid-state imaging device, a blue photodiode (photoelectric conversion unit) and a red photodiode (photoelectric conversion unit) are formed in the depth direction in a silicon substrate. In addition, the solid-state imaging device includes an organic photoelectric conversion unit in which a green organic photoelectric conversion layer interposed between electrodes is formed on the upper layer of the front surface of the silicon substrate on the side of a light incident side with a wiring layer interposed therebetween. According to the configuration disclosed in Japanese Unexamined Patent Application Publication No. 2007-12796, since a light loss does not occur in the above-mentioned color filter, the sensitivity is improved. Moreover, since the interpolation process is not performed between pixels, a false color does not occur. Japanese Unexamined Patent Application Publication No. 2008-258474 discloses a back-illuminated CMOS image sensor including color filters, a photoelectric conversion unit with photodiodes laminated in a depth direction, and an organic photoelectric conversion layer. The solid-state imaging device disclosed in Japanese Unexamined Patent Application Publication No. 2008-258474 includes the color filters arranged in yellow and cyan check pattern. The photoelectric conversion unit formed by the red and blue photodiodes is disposed in correspondence with the yellow and cyan filters. Moreover, an organic photoelectric conversion unit is disposed in the upper layer of each photodiode. The solid-state imaging device takes out a green signal from the organic photoelectric conversion unit, takes out a red signal from the photodiode of the yellow filter, and takes out a blue signal from the photodiode of the cyan filter."